The Union fell 3-1 to new NASL side Jacksonville Armada in their first preseason game of 2015, conceding two goals in the 8th and 11th minute. Yes, preseason games are played so much for winning as for evaluating players, as the Union played 30 different players in the game. Yes, as the hilarious Armada broadcast team said, Jacksonville has been practicing everyday for two months for this game,whereas the Union got together for the first time two weeks ago and didn’t practice outside on a full size field until last week. Still, there were all too few bright spots to be seen on the Union side, and that can’t be encouraging to anyone. Recaps from PSP, Philadelphia Union, Daily News, CSN Philly, Philly Sports Nation, NASL.com, Jacksonville Armada, Jacksonville Times, Florida Times Union, First Coast News, and Sunshine Soccer News. The Union scrimmage against Tampa Bay Rowdies on Tuesday at their practice field in Clearwater. There are no stands at the field and no facilities for streaming the game. Hopefully, we’ll be able to see streams from games at the upcoming IMG Tournament but which games — if any — will be streamed has not been confirmed. International outlets are confirming CBS Philly’s report of the Union’s interest in Steven Vitoria. Actually, A Bola (crappy Google translation here) posted a report minutes after the CBS Philly report that says “Benfica has reached an agreement with the Philadelphia Union” for the loan of Vitoria for one year. Sapo Desporto (crappy Google translation here), Todo Mercado Web (crappy Google translation here), and Transfer Market Web are also reporting the loan as a done deal. At Brotherly Game, Nick Youngstein considers some of the paths to playing for the Union for young players outside of the Union Academy system. Brian Sylvestre, the Harrisburg City Islanders goalkeeper who was trialing with the Union, has signed with NASL side Carolina RailHawks. The City Islanders have transferred Robbie Derschang to fellow USL PRO side Arizona United. You will recall Derschang was a Union draft pick in 2014. More at Penn Live. Toronto officially unveiled Sebastian Giovinco on Friday. NYCFC have acquired 23-year-old Colombian midfielder Javier Calle on a year-long loan with the option to buy from Independiente Medellín. Montreal have suspended Ambroise Oyongo, acquired two weeks ago from New York Red Bulls, without pay for not showing up at preseason training following his participation in the Africa Cup of Nations with Cameron. The Cameroon FA says Oyongo’s contract is void because he had amateur status when he loaned last summer to NYRB by Cameroon side Rainbow FC Bamenda. Seattle midfielder Osvaldo Alonso has undergone successful right groin surgery. The announcement from the Sounders does not say how long he will be unable to play. In preseason play on Friday, DC fell 1-0 to Malmo, while LA topped Seattle, 2-1. On Saturday, Real Salt Lake defeated UC-Irvine, 3-1. San Jose drew 1-1 with Vancouver. It was also a 1-1 draw between FC Dallas and Jonkopings Sodra, and between Portland and Houston. Thousands of fans showed up for an Orlando City open practice on Saturday night, some 7,000, apparently. Lots of Okugo, Mwanga, and Ribeiro fans in Florida, I guess. 2-0 was the scoreline in Sunday’s US national team doubleheader, with the US Women falling 2-0 to France, and the US men defeating Panama in Carson. While it is true a number of starters were unavailable — Christie Rampone, Sydney Leroux, and Megan Rapinoe because of injury — a world power such as the US should have the depth to overcome such absences. Instead, the US Women were again exposed by a more technical side in France. Coming after the 0-0 draw with Brazil in December, the US has now been held scoreless in two consecutive games for the first time in 13 years. Looking back through over the past year’s results against non CONCACAF teams that have qualified for the upcoming World Cup, the US now has a 5-3-5 record. Two of the wins were against China, a team that has not defeated the US in years, scoring three goals over 8 matches since 2012 while conceding 25, and two others were 1-0 wins. Recaps from PSP, US Soccer, Fox Soccer, ProSoccerTalk, SBI, Empire of Soccer, Examiner, Vavel, and the AP. At Soccer America, three takeaways from the loss, at SI, three thoughts. Michael Bradley scored an Olimpico, and Clint Dempsey scored a very nice goal of his own as the US Men ended their 5-game winless streak with a 2-0 win over Panama. Recaps from PSP, US Soccer, MLSsoccer.com, ASN, Washington Post, the Guardian, ProSoccerTalk, SBI, Yahoo Sports, Goal.com, Vavel, the Sports Network, and the AP. Player ratings at MLSsoccer.com, ESPN, ASN, Soccer America, ProSoccerTalk, World Soccer Talk, and Empire of Soccer. SI has three thoughts on the win, ProSoccerTalk and SB Nation have three things learned (ProSoccerTalk also has three “burning” questions), Soccer America has three takeaways, Fox Sports has five points, Goal.com has the good, the bad, the ugly, SBI has a breakdown of the game. MLScoccer.com, LA Times and SI, and Goal.com note the impressive play of Gyasi Zardes in the win. Michael Bradley said of Zardes, “He’s shown that, without a doubt, he’s a guy that has to be in this group going forward.” It’s true. At ASN, Leander Schaerlaeckens wonders if Klinsmann knows what he’s doing. Former USMNT fitness coach Pierre Barrieu is confused by Klinsmann’s recent comments about the fitness of US players. At ESPN, Doug McIntyre says Klinsmann’s sometimes controversial statements are aimed at sparking a conversation, not a fight, within the US soccer community. Ivory Coast defeated Ghana in an epic penalty kick duel to win its first Africa Cup of Nations championship since 1992 when they, amazingly enough, defeated Ghana on penalty kicks in another epic duel. Ivory Coast missed their first two PKs. 8 pk goals later, goalkeeper Boubacar Barry — who was only playing because of an injury to the Ivory Coast’s usual starter, saved the attempt from Ghana goalkeeper Razak Brimah and then beat Brimah with his own attempt for the winning goal. Crazy stuff. The third place game, which also went to penalty kicks after ending scoreless, was won by Democratic Republic of Congo. The CAF has banned Morocco from the 2017 and 2019 editions of the Africa Cup of Nations for backing out of hosting this year’s tournament over Ebola fears. CAF also issued a $1 million fine and is demanding €8 million in damages. The violence late Sunday, which prompted the Cabinet to suspend the national football league indefinitely, came three years after Egypt witnessed one of the deadliest soccer riots in the sport’s history, and dealt a further blow to the military-backed government’s attempt to project an image of stability after four years of political turmoil. More on the events in Egypt from Goal.com, Reuters. Sepp Blatter thinks coverage of the violence that interrupted the Africa Cup of Nations semifinal match between Ghana and Equatorial Guinea was over played by the media and presents a negative image of Africa. Stumping for votes much, Sepp? No word yet on what he thinks of the coverage of events in Egypt. CONCACAF president Jeffrey Webb has reiterated his support for the region hosting the 2026 World Cup. Bradley’s goal is something! Find a highlight URL and enjoy it. In roughly four decades in the game I have seen a goal scored directly on a corner kick one other time, but it was near post also upper ninety. How difficult/costly would it be for the Union to find a European club to be an affiliate with? I’d have to imagine training with a club over there would be more beneficial than what their existing training camp / preseason is while also providing a new outlet for them to bring in talent (think youngsters that aren’t getting any first team time or veterans coming back from injury). Is this something Rene Meulensteen could help with? It could go along way with bringing in more players, but potentially adding another revenue stream. Would it really be that far fetched? This is something I had thought about, too. Couldn’t we send 4-8 guys over in the offseason to train with their team, or in their Academy? We can sell their merchandise here and play an exhibition each summer and give that team a better American exposure. A team like Southampton, or Dortmund, or other teams known for youth development would be preferable. Renee wouldn’t be caught dead near United as long as LVG is associated with the club. A genuine disliking. I actually floated the idea to a friend that the Union could try for a Man U link with Rene a consultant and with the City/United rivalry considering the proximity of NYC and Philly. Stylistically, I think Southampton would be the best team to learn from given their academy and finances. With that said, so far I think most other teams are looking at NYCFC and their relationship with Man City as a one way street. Unless that changes in the next few years I doubt any other MLS team would look to make a link in Europe. NYCFC/Man City is a different animal because of the finances involved. 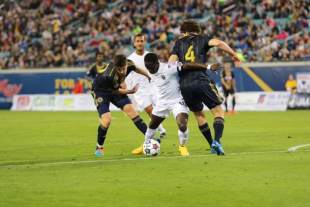 If a team like the Union paired up with a Euro team, it would be a smaller team. I could see a mid-table Ligue 1, BPL, or Bundeliga team. Someone that doesn’t have unlimited funds and needs to added finances provided by a spot in the American market. The logistics are obviously something for more than a 2-paragraph snippet, but it could be mutually beneficial, if the correct team is selected. Union Berlin would be a fun match based on the name. I know nothing about their finances, player development, academy, etc. Ok, I’m going to pretend the game Saturday didn’t happen for my own sanity. Too early to get fired up. Let’s assume that the Valdes/Vitoria swap gets completed. What is the next piece/pieces that MUST be had before the season? Assuming a 4-2-3-1. Thinking game day roster of 18 plus 5 to make the 23. This doesn’t include the likes of Berry (who wants to leave if not starting) or Lee (who could go to Harrisburg, or Wheeler (same). I would say the back is still very shaky. The CB pairing would be a guy who just came in and 3 guys we can’t really trust. I think a LB should be the first thing added. Then another FWD. After that Fred and Carroll should go and bring in another Mid. We must get a legitimate striker. We don’t have a single starting quality guy on our roster, and playing a 4-5-1 without a quality striker can only end in disaster (as we saw when Casey went cold last year). That has to be priority #1. Priority #2 should be a CDM. Edu played much better at CB than at CDM last year, and I’m not comfortable with White or Marquez starting right now. But it’s also really clear that we need a 3rd GK (why hasn’t McCarthy become official? ), depth at outside back, and at least one more midfielder. This team still has a lot of holes. I wish Derrick Jones all the best. Hope he can make an impact. The fact that he played for more than a year for Lower Merion SC was of course not mentioned…. Did anyone see the videos from Egypt?! People were packed in a contraption like cattle. Some of those had no tickets but the design of the contraption made it impossible to turn these people back. This is quite different than what happened during the semi’s. Not to give the Union a pass for their performance in the game on Saturday, but I think there are a lot of MLS that are going to get more than they can handle from NASL sides in friendlies, and in the US Open Cup. I’m wondering if MLS’s byzantine rules are making the truly skilled (but not name) players look elsewhere. We should have a promotion/relegation system, with the NASL. But then organizations would face consequences for not progressing! As they should. Clubs should earn their spot in the top league. Meritocracy. I know — a crazy idea not rooted in money. Nice to see some of that McDonald’s money go to something that will combat the foulness its food causes. That Jacksonville broadcast team really was terrible. Between mispronouncing just about every Union name, and not knowing who was on the field half the time… I needed up watching the game on mute by the end. The MLS can’t spare $5-$6 million dollars on goal line technology?! Are you kidding me?!? Man the league is really pushing this whole “we are SO BROKE, we can’t have free agency” BS. Bradley’s goal was great. He reminded me of a pitcher setting up a batter with a few outside pitches, then jamming him inside. A few minutes before he scored, he hit one to the near post, that almost beat Pinedo. Then he went long. That was excellent. Vitoria’s (fake?) Twitter feed sure makes it sound like a done deal. But I will worry that something — Nick Sak changing the deal, Gerber stepping in to assign him to Orlando, trade embargo against Canada — will go wrong until I see the announcement from the Union. Egypt…so sad. Brings back memories of Hillsborough. The thing I don’t get though, is how do you continue to play a match when more than two dozen of your supporters are lying dead at the gate prior to kickoff? I just don’t get it.